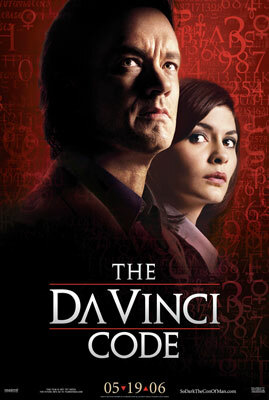 I’ve joined the rest of the world in seeing The Da Vinci Code today – having never got round to reading the book. And it was exactly what it purported to be – a fun thriller film with one of the best lines in recent cinematic history (I’ve got to get to a library!) and villainous monks. I don’t really have much time for the critics who slated it because, of course, no critic worth his or her salt would endorse such a popcorn-perfect piece of populist hype. Of course it’s fiction. So is the Bible, although the latter has by far the larger body count and glaring plot holes. I really wish that this film did better than that sinister Narnia blockbuster, although sadly I don’t think it will. Oh, and I did quite enjoy the world ‘jpeg’ [sic] being part of the French subtitles. What is Le JPEG is French exactly? Oh yeah I understood it (I think! ) – already had a rough idea of the plot, of course, though. The Science faculty *and* Mr Taylor, why Dom; what a lucky man you are! "Headquarters got the JPEGS an hour ago, I decoded it quickly, demonstrated the Fibonacci sequence with a quick PPT, unfortunatly the Mac people without Office were having problems with opeing my presentation so I exported it to SWF using FlashPaper – once everyone understood I converted the photos to TIFF for perfect printing!!" Haven’t read the book and just got back from the film! I couldn’t for the life of me tell you what happened! Still, good action in some places though!